Wow, time flies! After watching our favorite film franchises over the years, it’s easy to get used to the way the characters look from beginning to end (unless it has been actual decades between the different film installments). 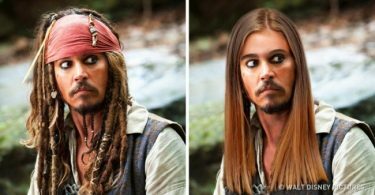 If you take time to compare how the characters look in the first and the last movie of a franchise, you’ll be quite surprised how much they’ve changed. 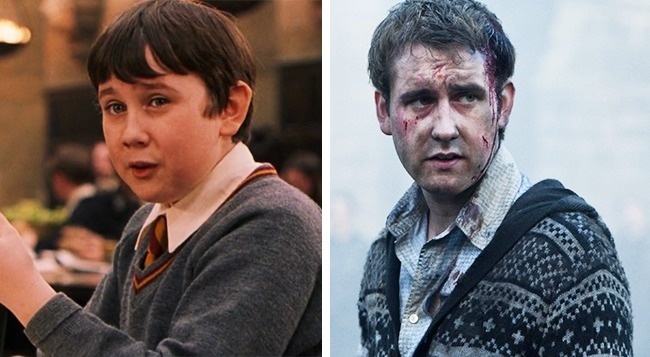 Neville Longbottom — 10 years’ difference. When Harry Potter and the Sorcerer’s Stone was being shot (this was the first film of the franchise), actor, Matthew Lewis was only 11 years old. After watching the Harry Potter movies over time, we’ve watched a funny young boy transform into a handsome man. The actor was 21 years old when the final film, Harry Potter and the Deathly Hallows: Part II was in production. 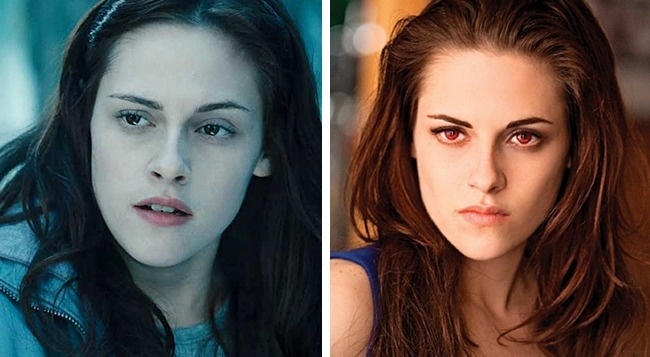 Isabella Swan / Bella Cullen — 4 years’ difference. Actress, Kristen Stewart was only 17 years old when the first film of the Twilight franchise was in production in 2008. She was already 22 years old when the final movie was shot in 2012. While the actress grew older, her character in the film was stuck at the age of 18. 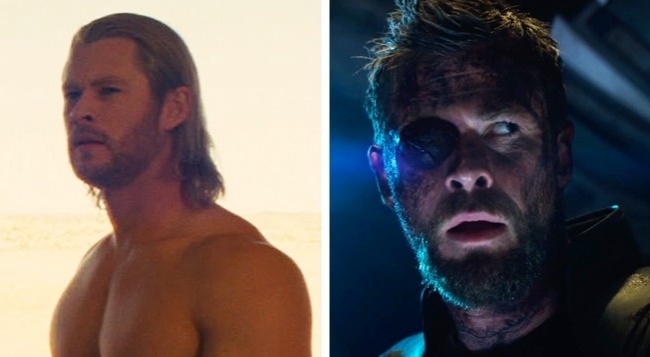 Thor — 7 years’ difference. Chris Hemsworth, a tall, handsome actor, was 28 years old during the production of the first installment of the film, Thor. At that time, the actor didn’t need any makeup to look like the Scandinavian God of Thunder. But in the movie, Avengers: Infinity War, set to be released in 2018, we will see Thor in a completely different way — and it’s not just because the actor is now 34 years old. Michael Corleone — 18 years’ difference. 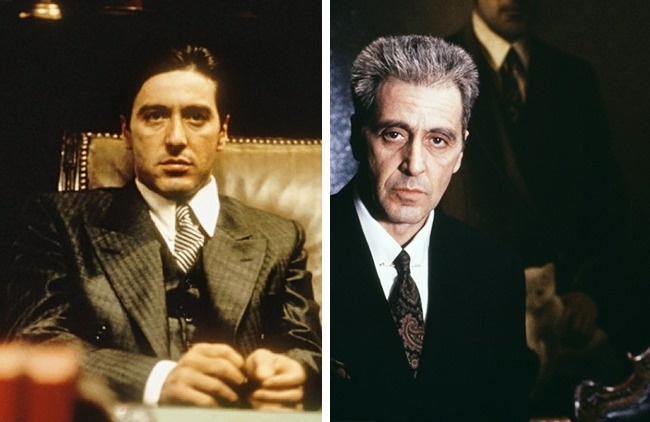 Charismatic actor, Al Pacino was just as great at the age of 32 in 1972’s The Godfather as he was at the age of 50 in the last Godfather movie produced in 1990. Pacino proves that some things are really timeless. John Dorian- 9 years’ difference. Actor, Zach Braff starred in the first season of Scrubs in 2001 at the young age of 26. 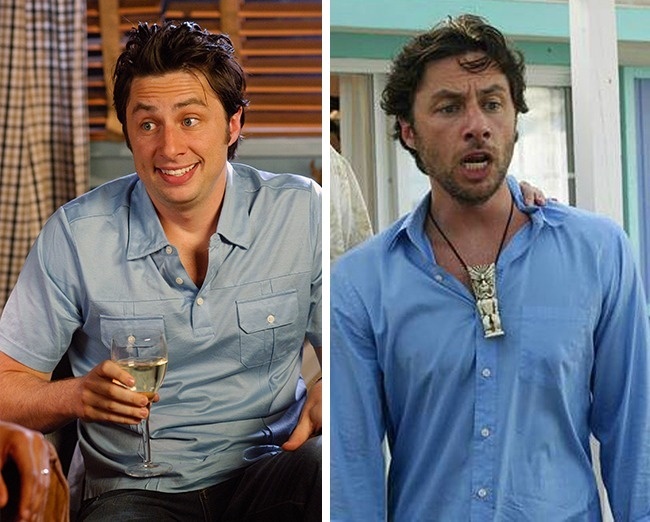 By the time the final season of Scrubs was released in 2010, he was already 35 years old. Sadly for fans of the show, there will be no more new seasons to come. Indiana Jones — 27 years’ difference. This is another character that has been on screen for a long time. Actor, Harrison Ford who played the main character in Indiana Jones and the Raiders of the Lost Ark was 39 years old when the movie was released in 1981. In 2008 at the age of 66 years old, Ford reprised his role in Indiana Jones and the Kingdom of the Crystal Skull. 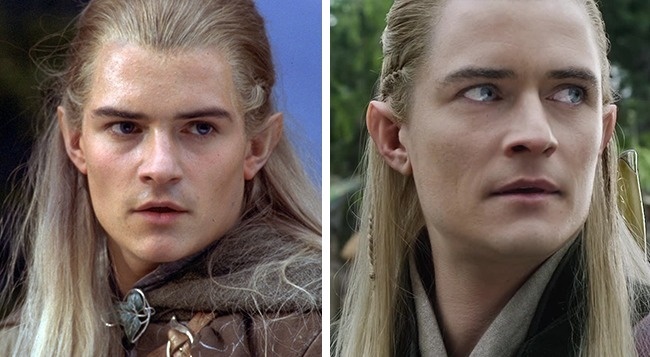 Legolas — 13 years’ difference. The youthful elf played by Orlando Bloom first appeared in The Lord of the Rings: The Fellowship of the Ring in 2001. The movie instantly became a legend. At the young age of 24 years old, Bloom had no trouble looking the part. However, it became much harder for him to fit the role in 2014 when the last movie, The Hobbit: The Battle of the Five Armies since the actor was already 37 years old. But thanks to skilled makeup artists, we were able to enjoy the forever young Orlando Bloom. Shelly Johnson — 27 years’ difference. Gorgeous 47-year-old actress, Mädchen Amick somehow managed to become even more beautiful in the 3rd season of Twin Peaks which was released in 2017. She was only 20 years old in 1990 when the first season of the show was released. Time may fly but some things stay the same. Dominic Toretto −16 years’ difference. 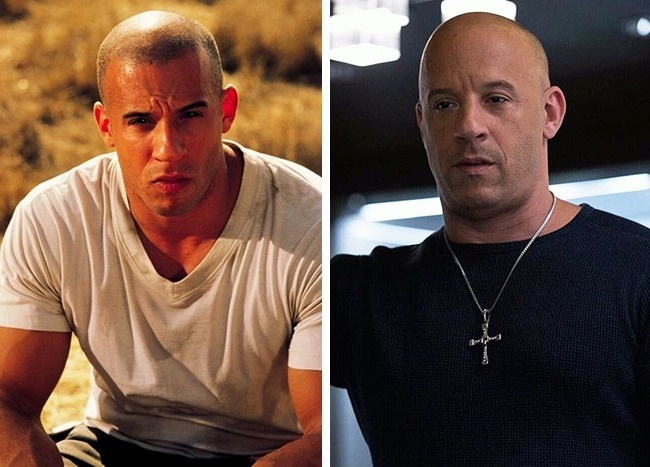 Brutal Vin Diesel seems to stay the same in each movie of the Fast and the Furious Franchise. In the first installment of Fast and Furious shot in 2001, Vin Diesel was 34 years old. When The Fate of the Furious was released in 2017, the action star was already 50 years old. He looks pretty great for 50 years old, if you ask us. Black Widow — 8 years’ difference. Mysterious and charming actress, Scarlett Johansson first appeared in the role of Natasha Romanoff in Iron Man 2 in 2010. Most comic fans loved the 26-year-old actress in the role. We can’t wait to see her this year in Avengers: Infinity War. 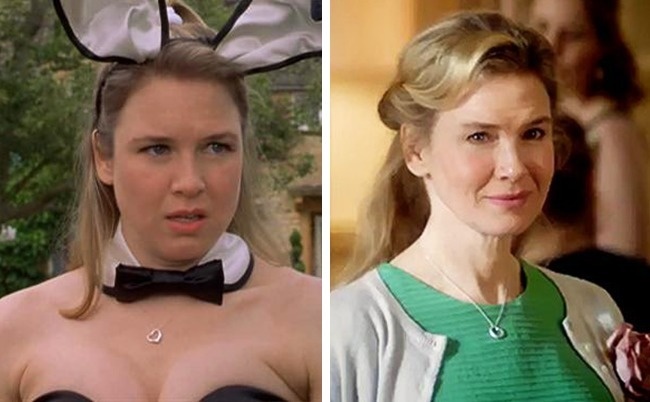 Bridget Jones — 15 years’ difference. Clumsy but cute actress, Renée Zellweger is often associated with Bridget Jones’s Diary, released in 2001 when the actress was 32 years old. Zellweger’s charm hasn’t disappeared even years later as the actress demonstrated in Bridget Jones’s Baby, released in 2016. 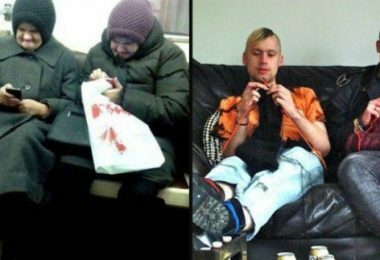 Danny Ocean and Rusty Ryan — 6 years’ difference. 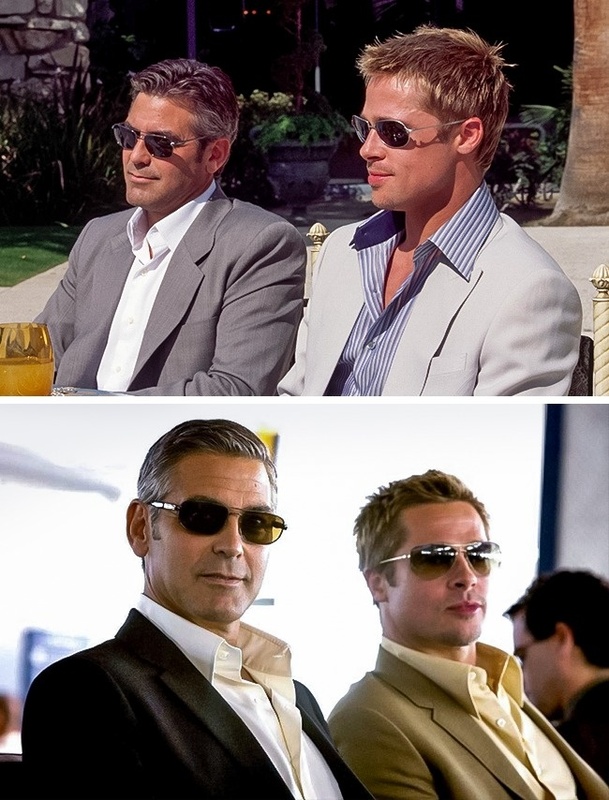 The inseparable pair of actors, George Clooney and Brad Pitt were a massive hit in 2001’s Ocean’s Eleven. And we were happy to see that nothing had changed in Ocean’s Thirteen which was released in 2007. Obi-Wan — 6 years’ difference. 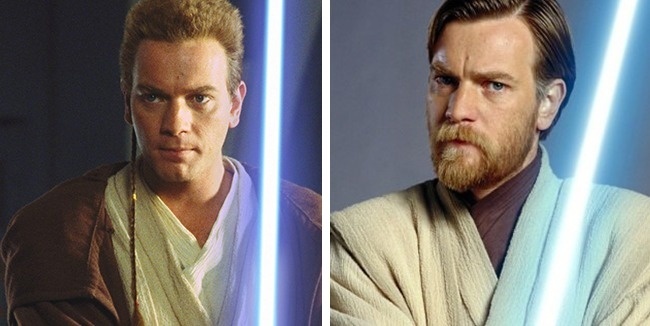 Actor, Ewan McGregor was 28 years old when he played the role of a Jedi in Star Wars Episode I: The Phantom Menace in 1999. And at the age of 34, he reprised his role in Star Wars Episode III: Revenge of the Sith in 2005. His character hasn’t appeared in the franchise since then. Which of these characters’ changes surprised you the most? Tell us in the comment section below!